You are here: Home / Forest Air, LLC Blog / Why Is It Important To Replace The A/C Air Filter In Your Air Conditioning System? If you own a home, then chances are you are familiar your A/C air filter, if for no other reason than you’ve had to change it from time to time. In the past, you had to kind of guess based on the rating of the filter when it was time to change it, but newer digital thermostats will actually give you a visual indicator that a filter needs to be replaced. The A/C air filter in your A/C system performs the extremely important job of removing particles from the air stream to keep the air conditioning system clean while also removing particles from the air. As the filter does its job, it gets loaded with more and more particles. Oddly enough, this actually has the side effect of making it more efficient, but it also increases resistance and reduces airflow. When this happens, it is time to replace your filter. The amount of time before your filter needs to be replaced will depend on how dirty the air is and how big the filter is. What Happens If I Don’t Change The Filter Or Remove It Altogether? 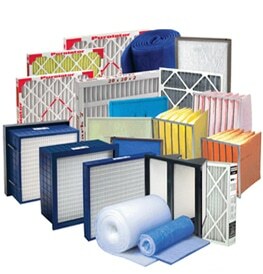 If you don’t change the filter, the air flow will go down, and the system will not perform well. Not only that, if the filter becomes too dirty, it starts to become a source of air pollution itself. If you take the filter out completely, you would solve the low air flow problem, but it would be shortsighted. The particles that the filter is designed to take out of the air will now build up on your evaporator coil and eventually cause it to fail. Evaporators are expensive, so do yourself a favor and just make sure to replace your air filter when its time. Trust us, your wallet will thank you. Forest Air provides a range of preventive services and system checkups, set up an appointment today.